Que par pensée elle ne parle à moy. Le plaisant mal que j’endure pour toy. Pour mille fois en mille corps renaistre. Cher comme il fut, puis que tu l’as chassé. That in thought she does not speak to me. The pleasing pain that I endure for you. To be born again a thousand times in a thousand bodies. Dear as it was, since you hunted it down. Blanchemain’s earlier version has a number of small differences, including the opening: “Las ! sans la voir à toute heure je voy” (‘Alas! Without sight of it, at every moment I see’). I’m not sure the replacement is a big improvement but it does remove the repeat of “voir … voy”. In line 10, the earlier version has “Ny ne seroy-je, allassé-je là bas”, the later version providing a better caesura in mid-line; the last tercet a number of small differences – the main improvement being the loss of that “sans plus” which seems unsure what it refers back to – more of what?! Mien comme il fut, puis que tu l’as chassé. Mine as it was, since you hunted it down. A short interlude now as I am away for a week or two. D’honneur aux siens, je l’avois à mespris. Que d’ignorant je devins bien appris. Vous me causez vous-mesmes tels effets. Si je fay bien, tout le bien que je fais. The Muse brings her own, I scorned her. That, from ignorant, I have become learned. You yourself bring about such results in me. Whenever I do something good, all the good that I do. Here the repetition works rather less well than in the final couplet – and is just as clumsy as my translation! There is also one other minor change, with far less impact, in line 11 where Blanchemain has “ces effets” instead of “tels effets” (‘these results’ rather than ‘such results’). Que j’ay plus que ma vie en mon âge estimées. Quelque peu de renom pour un peu de sçavoir. Ou comme poudre en l’air vainement consumée ? Que te sçauroient donner les Muses qui n’ont rien ? Appeller un bon fol en toute compagnie ? D’huis en huis mendiast le miserable pain. Et se faire du peuple en tous lieux bonneter. Sa sœur n’a rien laissé qu’une lyre moisie. En secourant autruv on gaigne la richesse. Car envers les soldats un bon Prince n’est chiche. Creuse et pleine reprend l’erre de ses travaux. « O qu’il est mal-aisé de forcer la nature ! « Le destin qu’en naissant il versa desur nous. Plus à faire des vers la fureur me poussoit. Autour de moy dansoient à cottes degrafées. Que d’estre sans honneur à Rome le dernier. En servant mon pays, plus d’honneur que d’avoir. Que le siecle ancien est par toy surmonté. Ton cœur de ton instinct pour suivre le contraire. Mais suivre le destin duquel elle est poussée. Quelque desguisement dont l’homme fust vestu. Un Roy tres-magnifique en t’ayant rencontré. Maugré tous ses parens a mis sa fantaisie. Qui comme vent portoyent son nom par l’Univers. Que la seule vertu m’accompagna de toy. Whom I have honoured more than my life in this age. Some little fame for little understanding. Or like ash in the air burned up without gain? What can the Muses give you, who have nothing themselves? Called a right fool in all company? He always dies, welcomed by pale famine. To beg from door to door for the wretched pain. And make oneself lionised by people in all places. His sister left nothing but a mildewed lyre. In helping others, you can win riches. Too afraid to undertake earthly dangers. Both hollow and full, takes up the course of her labours. “Oh how uncomfortable it is to force nature! The more the passion to write verse drove me on. Danced around me, their skirts unfastened. Than to be the last, and without honour, in Rome. In serving my country more honour than wealth. That ancient times are surpassed by you. Your heart from your instinct to oppose them. But to follow the destiny by which she is impelled. Whatever disguise a man was dressed in. A most magnificent King in having encountered you. Despite all his family has set his imagination. Which like the wind bore his name throughout the world. That virtue alone accompanies me from you. In the second ‘stanza’, Homer’s two daughters are the epic poems Iliad and Odyssey. In the fourth, the advice to ‘caress Bartolle’ apparently refers to a ‘spiky’ senior lawyer (he’s referred to elsewhere as “l’espineux Bartolle”). In the 5th ‘stanza’, Marty-Laveaux’s text has “Hippocras”: hippocras is a drink, but Ronsard (or his father) here clearly means Hippocrates the Greek physician. I’m not sure whose mistake this is – I suppose Ronsard is making fun of his father for not quite getting the name right?! Blanchemain’s version has “Hippocrate” so Ronsard (or his father, or Blanchemain) obviously had got the right one at some stage… The island Hippocrates honours is Cos, where he was born. His medical learning comes from Apollo, because Aesculapius was Apollo’s son; Apollo’s sister is Minerva. Qu’une vile truelle à trois crosses tymbrée ! As a vile trowel stamped with three bishoprics! Tout sot se laisse errer accueilly de famine. All those fools allow themselves to wander in error, welcomed by famine. Later on, the Sun’s chargers are “haletans de la penible trette” (‘panting from their arduous pulling’); and the fairies dance “à cottes agrafées” (‘their skirts pinned up’). As for Ronsard’s Latin, “Mais cognoissant, helas! que mon cruel destin … ” (‘But recognising, alas, that my cruel fate / Had not made me naturally skilful…). and later “Toutefois si as-tu suivi ton naturel ” (‘Yet always have you followed your nature’). Who sings out his death on the banks of the Mæander. Far from the worldly charms which deceive the best of us. Free from the ties of the body to be simply a spirit. A really beautiful excerpt from Ronsard’s “Last poems”. Elegantly weighted, and beautifully balanced. Un autre croist, tant le suget m’est dous. Me laisse froid sans haleine et sans pous. Et toutefois je me plais en ma braise. Moy de mourir, et vous de me tuer. Another rises, so sweet is the subject to me. Leaves me cold, without breath or heartbeat. And still I am happy in my burning. Me to die, and you to kill me. For poem no.100, almost inevitably one which is almost two different poems, so much did Ronsard re-write! Blanchemain prints the later version (above) in a footnote – though with a variant in line 13, which reads “D’un mesme mal nous sommes tous deux aise” (‘with the same wrong we are both satisfied’). But his primary version is the substantially-different poem below; it’s a pity he didn’t change the first line too, then it would be more visible that this is a ‘new’ poem! L’esprit emblé d’un ravissement doux. Me laisse froid, sans haleine et sans pous. Revent cela qui plus leur est contraire. Que je ne pense en vous qui me tuez. My spirit, rapt by sweet delight..
Dream of that which is most harmful to them. But think of you who are killing me. Chantent de toy : ce n’est que poësie. D’un mesme mal, tu serois soucieux. Faisant d’obscur un temps serein et beau. Mais un Bouvier qui meine les bœufs paistre. Sing of you; that’s just poetry. With a similar pain, you’d have been more caring. Making the dimness into fine and fair weather. But rather a cowman leading his cows to pasture. I do love Ronsard in humorous mode; and his rudeness to the sun is wonderful. I especially like lines 5-6 – ‘that’s just poetry’, says Ronsard who simultaneously wants us (and Cassandre) to believe in the underlying truth of his own love poems, and more importantly in the power of poetry, its function of being more than just pretty. 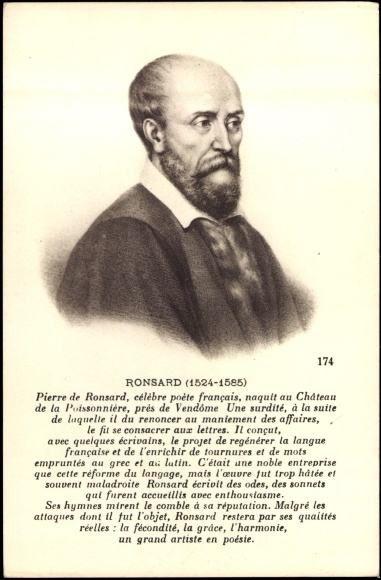 Whether Ronsard wanted to ‘change the world’ with his poetry is a complex question, but I think the sheer volume and variety of his poetry, and its commentary on contemporary issues, strongly suggests he believed his poems could structure arguments and influence outcomes. So “ce n’est que poësie”? Tongue firmly in cheek, and a strongly ironic inflection, I think!